In March, based on our monthly theme ‘Who is an Indian’ we looked at citizenship debates in the Constituent Assembly. The previous posts focussed on the interplay of citizenship with religion, race and birth and separate state citizenships. In this post we will examine the debates around citizenship provisions which were discussed on 10th August 1949, 11th August 1949 and 12th August 1949. Particularly, using word analysis, we will investigate the words that the Assembly Members invoked the most. What is striking about the debates on citizenship is the sheer number of amendments that the Assembly Members sought to move. Rajendra Prasad, the Chairman remarked: “I find there is a veritable jungle of amendments, something like 130 or 140 amendments, to these two articles”. But most of these amendments were either withdrawn or voted out by the Assembly. The second most referred word was ‘Pakistan’. The Assembly members were debating these provisions amidst their fresh memories of partition. Even though specific references to partition were sparse, the members did not shy away from invoking ‘Pakistan’. P.S. Deshmukh sought to add a residuary provision according to which every Hindu or Sikh not being a citizen of any other State irrespective of their residence would be entitled to be citizen of India. If Pakistan was created to ensure that Muslims have a “home of their own”, he argued that India should become the home for every Hindu or Sikh. Jaspat Roy Kapoor sought to allow for migration from Pakistan to India ‘on account of Civil disturbance or the fear of such disturbances’. All references to Pakistan were not made in unpleasant contexts. Brajeshwar Prasad urged for making citizenship provisions wider and noted that ‘all the people of Pakistan should be invited to come and stay in this country, if they so like'. ‘Parliament’ was invoked the third most during the citizenship debates. 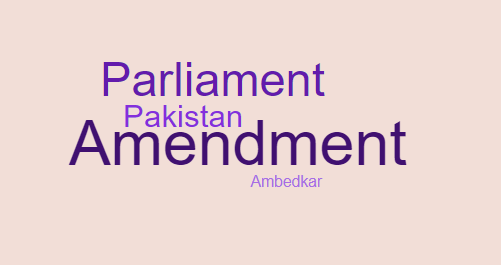 The text of the Draft Articles 5C and 6 (Articles 10 and 11 of the Constitution of India, 1950) have ‘Parliament’ in them – all debates around these two articles made reference to ‘Parliament’. Further members including Ambedkar, Rajendra Prasad and Alladi Krishnaswamy Ayyar invoked ‘Parliament’ to repeatedly remind the Assembly the provisional nature of the Draft Articles on citizenship. They pointed out that the function of making a comprehensive citizenship and nationality law was deferred to the future Parliaments.